Vincenza Blue Lavender Seeds 5582. Vincenza Blue lavender is a tender perennial reliably hardy to Zone 7 without winter protection and can often overwinter to Zone 5 with winter protection. 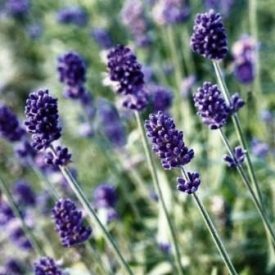 Lavender will flower deep into the fall and is a very good summer performer that withstands heat and drought conditions. In warmer areas of Canada, it can grow large enough to form a small informal hedge. Bees and butterflies just love the deep blue fragrant blossoms. 800 seed/gram. Sow seed 3 mm (1/8″) deep and 2.5 cm (1″) apart directly outdoors in a sunny site with well drained soil in late May or in late August/early September in Zone 5 and up. 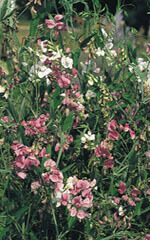 Thin plants to 30 cm (12″) apart in the garden. Seed can also be started indoors in a soil-less mix 10 weeks before last frost date. Keep at 21 C (70 F) for the 14-30 day germination period. After germination, grow on under lights at a slighter cooler temperature before hardening off and transplanting outside in the spring after the danger of frost has passed.